The University of Abuja (Uniabuja) on Wednesday 20th day of March, 2019 lost one of her own in a Ghastly motor accident along Zuba/Gwagwalada road. Udo-Obi Malachi Ezechukwu a 100 level student for Law who was admitted this year lost his life in a Ghastly motor accident. According to reports from a reliable source, he was going to Mini Campus (Gwagwalada) to collect his dorm number when a trailer driver missed his brakes and crushed him to death. According to eye witness reports, the collision was very severe that it left his head splattered open. Some students of the institution have however taken to their social media accounts (@bonychicken) to express their sadness on the death of their own. 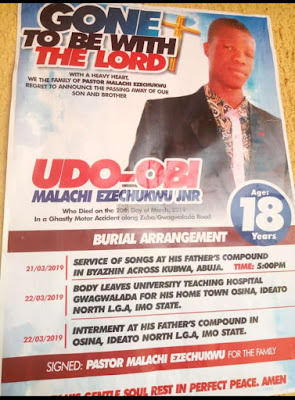 Below is a picture showing the burial arrangement for the great Student.